I've been meaning to write a brief review of this book for a few weeks now, and I'm finally getting a chance to tell you about it. 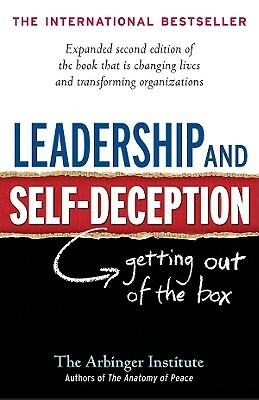 This one is called "Leadership and Self-Deception" by the Arbinger Institute, and I really think you should read it. Why, what am I saying about you? That you are self-deceived? Of course. But probably not in any ways that the rest of us aren't. If you are in a leadership position of any kind, but especially if you are a family member, and most importantly if you have any interpersonal relationships of any kind (have I covered you yet? ), you should read this book. Marcos brought it to my attention because it was a sworn gem by a number of leaders he knows and respects, and I love them for introducing it to us. We tried to be those people who really get into a book and then buy thirty copies for all of their dearest friends, but then we looked at the cost of buying thirty copies and I decided to tell you about the book so that you can find it on your own. In case you were wondering, "Why is she so into this book?" this is the gist: When we ignore our promptings to serve people in our lives who need our help (and this can be really little things, not just big things), we can "get in the box" toward them, and begin to create a false "story" of sorts that helps us to justify our lack of action by inflating our virtue and lowering their "deservingness". When we are in the box towards them, we view them according to the qualities that we've assigned them in order to justify our behavior, and it isn't until we get out of the box that we can truly see and value them. The principles are basic, and timeless, and are so simple but reading it helped me to peel back some fog that was getting in the way of seeing people in my life just as they are: people who have wants, desires, goals and needs like my own. At the risk of sounding really cheesy, I have to tell you that since reading this book things have changed in how I get along with people I am close to. Ultimately, I suspect that this book is effective because although the book uses other terminology and is not spiritual or religious at all, it is another way of applying the principles that are most important to me: love, honesty, being prompted to do the right things for others, and repentance or learning to improve. I think it must be because I have a girl, and I plan for her to be an amazing force for good someday that keeps drawing me to this video. I love how it inspires me to take very good care of my girl. I've never given a dime to the organization, but I plan to someday when I have a few extra. This is truly where great design meets social justice. Yesterday was the marathon of workdays for me. I went in at 9am and had an evening event that went until 8pm, so in the early afternoon, Marcos, Mamãe and Gigi rescued me for a mid-day walk in the sun! We walked around the UNC Arboretum enjoying the spring day and the tiny little buds on the trees, and then went for gelato on Franklin Street. It was so refreshing to get outside in the sun, and stretch my legs with my loves. Marcos' Papai passed away on December 1st, and it has been our privilege to host Mamãe for six weeks as she is traveling to visit family and figure out her life plans from here. It's been such a treat to have her in our home! She has been so helpful with Gigi, adding happiness and wisdom to our lives, watching shows with us late at night and staying up talking and laughing, helping us host our dinner parties, spoiling us with her best cooking, helping us keep toys picked up, and being so respectful and aware of the little routines and nuances of how we've chosen to lead our little family. I feel sorry that our home is small and we can't offer her much privacy, but all that stuff seems unimportant right now when we are living so peaceably with each other. The thought of joining forces in-home with in-laws can be scary for some people, but you should try having Mamãe over! I thought we got lucky when my mom moved to North Carolina, and now we are very doubly blessed. Now that six weeks have passed and I'm not as emotionally attached to all 750 of the photos I took over our holiday vacation, it's time to come back and enjoy a post or two about Hawaii! So let's rewind. On the 24th of December we flew to Portland for a few days of family time at my Aunt's home for Christmas, and on the 27th we all flew together to the Big Island of Hawaii. At the beginning of last year I suggested to the family that we should make my Grandpa's 90th birthday a family celebration, and thanks to the generosity of my Grandpa and Uncle John, it actually happened! For the first time in way too long, all of my Grandpa's children, grandchildren and great-grandchildren were together in one place and it was so much fun. O'ahu is a very happening place. The Big Island is less so. Here is our view from the airplane as we flew along the Hamakua coast into Hilo. And here is Kapoho, the place where we stayed. Uncle John and Auntie Lani are exceptionally good people, and they attract good people to them. Some friends of their family own two beach cottages on the ocean, and we were lucky enough to stay there for the week that we were on the Big Island. The houses were very... what Lani called "beachy", but the location was a level of tropical paradise I'm not sure I've ever seen before. The photo above is the sunrise from the beach house, and the image below is the view from the end of the driveway. The neighbors across the street raise fish, hence the ponds. The Hawaiian Islands were formed when the earth's pacific plate moved over a hot spot which kept poking through the plate and creating new islands, so the chain of islands is the oldest at the top, and youngest at the bottom. The very youngest and southernmost island is the Big Island, and unlike O'ahu, which boasts gorgeous white beaches and more of a "Tropical Isles" Calendar look, the Big Island still has active volcanos, and is still largely made of black vocanic rock. In Kapoho in particular, the residents have taken cement and vocanic rock, and made up all kinds of rock wall formations to create ponds and rearrange the ocean water. It is really beautiful. One of the best features of our little beach houses were the two ponds right off of our porch. With cement and vocanic rock, the family who owns the houses created a "Private Oceanarium" on one side where we could feed and admire the many tropical fish, and a swimming pond on the other. Although the tops of the walls were all solid cement and easy to walk along, the walls themselves were made of porous vocanic rocks, with plenty of cracks for water to pass through, so our little ponds rose and fell each day with the tides! What's more, baby fish can also pass through the rocks and grow up inside the peaceful ponds, and so each side has a collection of resident fish that we could either feed, or swim with. In the photo below, the cute fish at the bottom of the photo is the Hawaii state fish - the Humuhumunukunukuapua'a. Guess how fun it was to teach that word to Gigi! Above, my Auntie Katy talks with cousin Sam, and cousin Jordan feeds the fish. They all (with Uncle Don) slept in one little cottage, and we slept in the other. They made such great neighbors for that week in Kapoho, and we really enjoyed our outings and especially down time with their family. Possibly the most popular attraction in Hilo is the Farmer's Market. We went to buy produce and other groceries to stock the kitchen in our cottage, but it was impossible to pass up the many foods they were selling. Marcos got his fix of spam musubi, Katy and I were more for the lilikoi (passion fruit) lemonade and sweet Thai sticky rice with taro steamed in banana leaves (below), and Jordan had fresh coconut water straight from the fruit with a straw. Soooo ono! Here is the edge of our cottage, with the patch of grass and the ponds in the background. Below, Gigi and Marcos take a dip in the swimming pond. Gigi and I swimming in the pond. Because of the rock walls the ponds were very calm, and my favorite thing to do was to hang out with the snorkle and float around admiring the fish we were swimming with. ...doing crossword puzzles throughout the day and for hours into the night, and playing scrabble with the girls. So fun! And those crossword puzzles... oh my gosh. Uncle Don had just received three books of crossword puzzles for Christmas, and he was kind enough to let us devour one of the books, little by little, every day that week. Jordan is in a Ph.D. program at Princeton and is, in general, quite the brainiac, and so with him at the helm and Sam, my mom, me and Marcos contributing the answers that fell into our realms of knowledge, it was a regular party. Katy and Don could have done them solo with their eyes closed. Super nerd fun. And whew! We made it through the first bit of the trip. Next in line: Grandpa Randy's 90th birthday party!